An earthquake has shaken parts of Kent, damaging buildings and disrupting electricity supplies. Homes in five streets in Folkestone had to be evacuated because of structural damage including cracked walls and fallen chimneys. The magnitude 4.3 tremor struck at 0819 BST and experts said its epicentre was a few miles off the coast in the English Channel. One woman was taken to hospital with a neck injury. Chief Superintendent Ally Hope said: "Given the time this happened and the number of people that were about we should be genuinely thankful that so few people were hurt." The injured 30-year-old woman was taken to William Harvey Hospital in Ashford. Kent Fire and Rescue Service took more than 200 emergency calls, from people concerned about a variety of issues ranging from structural damage to gas smells. EDF Energy said it had managed to restore electricity to most of the several thousand homes left without power in the Folkestone and Dover area. Ch Supt Hope said that the major transport infrastructure in the area also appeared to have escaped damage. "The information I have is that the ferry ports are running normally, and that the Channel Tunnel is running normally," he said. He said he was aware in some cases there are secondary tremors and called for people in the area to be alert, but not alarmed. 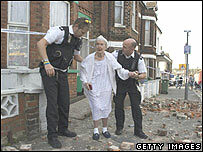 The Kent incident is the largest recorded in Britain since an earthquake in Dudley in 2002. British Geological Survey (BGS) seismologist Roger Musson said the tremor was around 4.3 on the Richter scale, with an epicentre 7.5 miles off the Dover coast. "This is by no means a complete surprise," he said. "There have been earthquakes in this location before. "Two of them have been some of the biggest earthquakes ever to affect Britain. "The first was in 1382 and in 1580 a quake with a magnitude of about six killed two people in London. "There were also smaller tremors in 1776 and 1950 in the area, which were in the "low fours" and on a similar scale to the one today. "It was a matter of time before we had another earthquake here," he said. Residents in Folkestone gathered outside their homes to survey the damage. The Salvation Army also comforted those affected by the tremor with shelter and refreshments. Up to 100 people, including families and the elderly, arrived at a church in Canterbury Road, Folkestone. 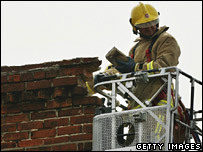 Paul Hatton, 38, of Folkestone, said he and his brother Neil initially thought the tremor was caused by an explosion. He said: "I was upstairs and my brother was downstairs and I heard a bang and thought that a lorry had crashed into something or that there had been a gas explosion. "I went outside and could smell a bit of gas and there were lots of people outside." Sam Millen, of Folkestone, was also at home when the earthquake struck. He said: "The whole place was shaking just after 8am, the TV was rocking backwards and forwards, alarms going off, lamps smashed onto the floor, and now the small cracks in the house have got a lot bigger." Paul Smye-Rumsby, who lives in Dover, said: "It was about 08.15 when suddenly the bed shook violently. "I thought my wife had got cramp or something but then I saw the curtains were moving and the whole house was shaking." Richard Ashworth, Conservative MEP for the South East of England, was at his Folkestone home when the quake hit. "At first I thought a lorry had crashed into the back of our house, but having lived in New Zealand I soon realised what it was. The entire house shook." Police want owners of local businesses which are empty because of the weekend to check their premises for signs of damage. The BGS is keen for anyone who felt the earthquake to fill in a questionnaire on their website so they can collect information on the impact of the earthquake to analyse in more detail its strength and precise location. Are you in the area? Have you witnessed any of the damage caused by the tremor?